U.S. telecom carrier Verizon and Samsung have announced to jointly launch one of the first commercial 5G smartphones in the USA in the first half of 2019. Samsung has confirmed the launch date of its Galaxy A8s smartphone. Of course, the announcement can not be coincidental as both the companies were in the race to launch the first smartphone hole in display since November and it appears that Samsung was just waiting for Huawei to announce the launch date. Samsung and Huawei both teased the announcement of almost all-screen phones with a circular cutout for the front-facing camera before the end of the year. The Samsung Galaxy A8s was recently also certified at the Federal Communications Commission (FCC) in the USA hinting that the handset also be launched in the U.S. soon. Huawei and Samsung have announced launch dates for the Galaxy A8s and the Nova 4. Samsung, which is set to launch world's first foldable smartphone early 2019, has partnered with Verizon on its 5G Home offering since the beginning of 2018. One can see the display cut-out for an In-display camera placed to the top-left corner. This brand-new model, which includes the latest Kirin 980 SoC, 6GB RAM, 128GB storage is going to release in China first. We were expecting an edge-to-edge design from Samsung with a hole in the screen for the front camera, but it looks like the bezels are still there. The Nova 3i, on the other hand, features a 6.3-inch screen of FHD+ resolution of 2340 x 1080 pixels with 19.5:9 aspect ratio and 409 ppi. In terms of cameras, the Galaxy A8s is expected to sport triple rear cameras at the back. 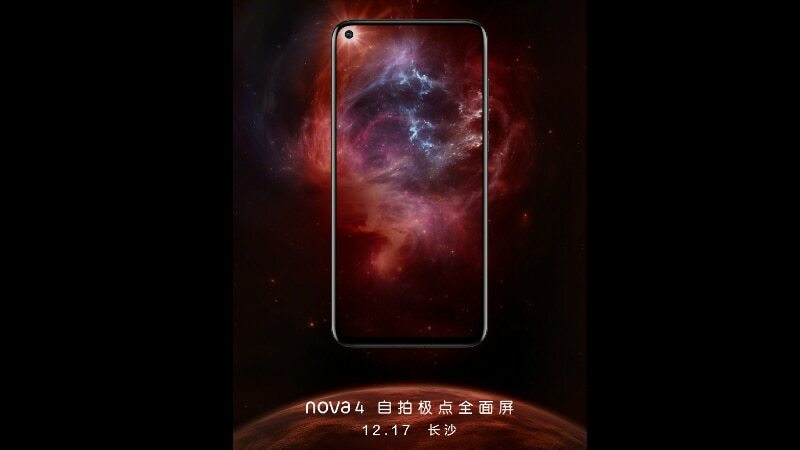 Samsung too is suspected to release its phone during December and in all probability will directly compete with Huawei Nova 4. The phone is said to ditch the 3.5mm headphone jack as well. We can't know for sure how accurate the details are at this point because these renders probably come from leaked CAD files, not the phone itself.